Longest post name ever, I think? 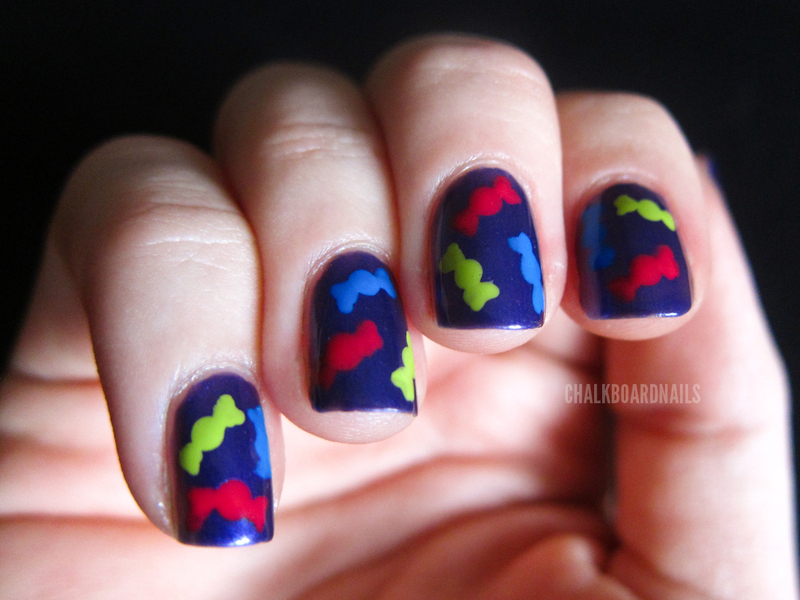 So, I think I talked about this before, but the final day of the original challenge is "Recreate your favorite mani." Those of us that were doing the challenge didn't like that idea, because why would we want to do something we've already done? So we decided to change it to ... well, just look at the post title. I had really liked the cute little candies in Rebecca's day 21, so I decided to recreate that! I did this on my left hand first, and the candies were too big. So I made them smaller on my right hand, and thought they looked much better. So you all are seeing my right hand today! It doesn't make an appearance very often! Unfortunately, my left hand is not as skilled at taking pics, and my right hand is not as skilled at posing as my left hand has become. So the pics look a little different than my usual style. I will tell you all that I did that intentionally, to keep you guys guessing and to keep your brains on point, but, SHH, I didn't. Here's Rebecca's super cute awesome original mani. She also added a Hello Kitty sticker to her accent nail after doing the candies, but alas, I have no HK stickers to my name. So I just had to stop with the candies. Which by the way, I made by using the large end of a dotting tool for the centers, and a short nail art brush for the little candy ends. Oh right, I should probably tell you guys what colors I used! The purple (it looks more purple in person I swear) is Sally Hansen Xtreme Wear in Deep Purple. The blue is China Glaze Sky High Top (are you shocked? I use this in pretty much every mani), the green is Sinful Colors Innocent, and the pink is China Glaze High Hopes. SO THAT'S IT! I successfully completed the 31 Day Challenge without missing a single day. 31 CONSECUTIVE DAYS OF THEMED MANIS! I'm pretty damn proud of myself. But now, I'm so tired of doing my nails that I won't be back for 3 months. If you'd like to check out every single one of the 31 days on one page, you're in luck! I made this convenient blog tab for you. I even coded the HTML to make it in a pretty little grid. The things I do for love. Congrats! I am starting the 31 Day Challenge today. I am looking forward to it! Just think what poor Melissa of The Daily Nail went through with 365 days of designs. Ouchie! So cute :-) Makes me hungry! You are awesome at doing nail art! I love looking at your blog! It's one of my faves! Congrats on the challenge. 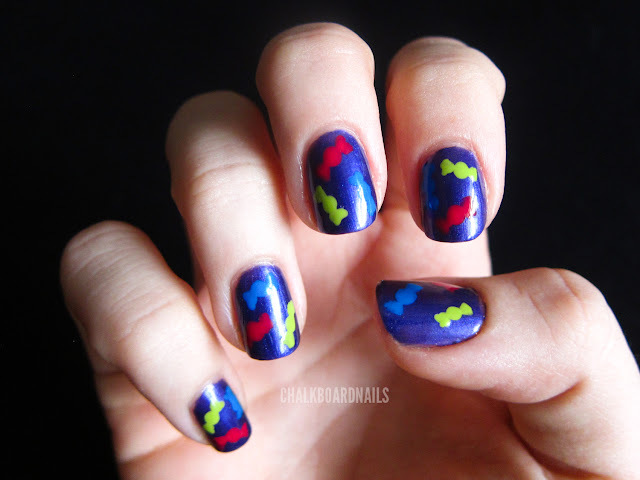 I'm just starting the challenge today, and I was thinking about day 31 and just could not see the point of re-creating one of the manis that I had JUST done! I really like the idea of re-creating a mani that someone else that was doing the challenge created. Mind if I borrow the idea? @kimberdevil - No of course not, please go right ahead! Those are way too cute... LOVE 'em!